Have you seen the HybridCenter? Check it out at www.hybridcenter.org. Hey everyone, on this Memorial Day weekend, our engineers cooked up this little guide to help folks get the best bang for the ever-increasing dollars we’re doling out for gas. Here it is, and drive safely (and efficiently) this weekend if you’re headed out on the roads! The Union of Concerned Scientists (UCS) has some simple advice for the 32 million Americans AAA expects to be on the road this Memorial Day weekend that will save them money, cut gasoline consumption, and reduce global warming pollution at the same time. At today's national average regular gasoline price of $3.83 per gallon, even small increases in fuel economy can add up to big savings. Over the short-term, UCS says, drivers can reduce their fuel use with routine maintenance and smart driving habits. Over the long-term, the national science advocacy group recommends that they buy more fuel-efficient vehicles. CHECK YOUR TIRES. Just as it's harder to pedal a bike with a flat tire, vehicles with underinflated tires require more energy to move down the road. According to DOE, keeping tires properly inflated can boost fuel economy about 3 percent, equivalent to an 11-cent-per-gallon discount at the pump. Tires naturally lose 1 to 2 pounds of pressure (pounds per square inch, or psi) each month, so if you haven't checked them lately, there's a good chance they're underinflated. Be sure to follow the instructions for safely inflating your particular tires. Overinflating tires increases the risk of a blowout. GET A TUNE-UP. Make sure your car is in top shape by getting regular tune-ups, spark plug checks, oil changes, brake and fluid level checks, and air filter replacements. According to DOE, replacing a dirty air filter alone can boost mpg as much as 10 percent. At today's fuel prices, that's equivalent to a 35-cent-per-gallon discount. BE WEIGHT-CONSCIOUS. Don't overstuff your car with unnecessary items for your Memorial Day trip. For every 100 pounds of extra weight in your vehicle, fuel economy decreases by 1 to 2 percent. In other words, adding 100 pounds of luggage to your car is akin to paying 4 to 7 cents more per gallon. If you must pack a lot of gear, try to fit it inside the car instead of on a roof rack. Roof racks create wind resistance that can lower fuel economy. Well, Patty isn’t the only one calling out Johnson over his “justification” for denying the clean car waiver. A number of articles took the EPA administrator to task, and this fantastic blog by Lisa Heinzerling, the Georgetown professor who wrote the plaintiffs' briefs in the Supreme Court case on auto emissions and global warming, really helps put this decision in its proper context. This scathing editorial from the New York Times, and the fact that unionized EPA workers are withdrawing from a cooperation agreement with political appointees who supervise them really shows the depths to which this ill-founded decision has taken the agency. The lines on this particular fight seem so stark, and the stakes so high; it ‘s like something out of a Hollywood legal thriller—especially when “The Governator” himself is right in the middle of the action. So we helped our friends over at SaveOurEnvironment.org with a fun little “movie trailer” to let activists keep up the pressure on states that haven’t joined the lawsuit. You can head right over to the action page to check out the video created by the good folks at Free Range Graphics (you’ll notice our green minivan design—The UCS Vanguard—plays a significant supporting role…). So go check it out and pass along the fun…and the outrage. Hello everyone, Patricia Monahan here, the Director of the California Office at UCS. The US Environmental Protection Agency just issued its formal rationale for denying California and 12 other states the right to cut global warming pollution from cars and trucks. According to the EPA, the state of California does not have “compelling and extraordinary conditions" required for a waiver under the Clean Air Act. This bizarre interpretation of the Clean Air Act implies that the inundation of California’s coastline, the loss of 50 to 80 percent of Sierra Nevada snow pack, and the potentially profound and costly changes to state agriculture are unworthy of unique attention. EPA Administrator Johnson discounts the impact of climate change on California. He is quoted "I'm not saying that California isn't experiencing problems as a result of global climate change. There are in fact other parts of the country that are actually worse." Now that the details are out, we can see exactly why his staff scientists, analysts, and lawyers were lined up against his decision: Johnson is not only wrong on the science, as I note above, but he’s wrong on the law. Compelling and extraordinary does NOT mean unique. If the conditions had to be unique, then why would other states be allowed to adopt the California standards? Given the profound near-term effects specific to California, there is no rational way the Golden State does not meet the “compelling and extraordinary” standards. Unfortunately, Administrator Johnson seems more interested in protecting the interests of recalcitrant automakers, rather than obeying the law and the mandate of the Supreme Court to fight climate change through cleaner cars. Together, the states that have adopted California’s vehicle standards comprise about one-third of the new vehicle fleet. According to the California Air Resources Board, implementing the clean car standards in these states would cut greenhouse gas emissions by 204 million metric tons of global warming pollution (carbon dioxide equivalent emissions) compared to business as usual. That’s nearly a 90 percent reduction in global warming pollution from the CA standards relative to the newly passed federal fuel economy standards. Indeed, those federal fuel economy standards were created as part of an energy bill. Global warming pollution is not mentioned in those standards, nor is the right of California to tackle global warming pollution from cars in any way modified or preempted. In the face of growing evidence that climate change is happening faster than experts anticipated, Administrator Johnson is putting the brakes on state actions to address the problem. So, unfortunately it may be up to the states to push the Agency out of the way. We didn’t need another lawsuit—we need solutions. Hi folks, Aaron Huertas here in the UCS media department. I’ve been helping ScottN get out the word on this EPA blog effort. I wanted to let everyone know your comments are being noticed by the EPA and beyond. Take a look at this great piece by Marianne Lavelle, the Energy Editor over at US News and World Report. Just a reminder to folks: this blog is not an EPA-wide blog (as opposed to what the Department of State does, for instance). It's a blog by the Chief Operating Officer so it tends to deal with the work I do. That work doesn't always align with the EPA business some people are most interested in. Of course, the responsibility over the EPA waiver decision rests with Administrator Johnson, but that has not stopped Peacock’s blog from commenting on this issue not once, but twice as far as I could find. Beyond that, the Quarterly Management Report (.pdf) from Peacock’s office documents two areas where the waiver most definitely applies. First, the report measures EPA's performance related to Congressional interaction. The report says, “Constructive interactions with Congress ensure appropriate tools and resources are available for protecting human health and the environment.” Yet EPA staff was certainly not permitted to be constructive in meeting Senator Barbara Boxer's request for information about the waiver denial according to this op-ed the senator wrote. Additionally, Peacock’s office measures EPA effectiveness at workforce recruitment. The report says, “Recruiting a talented staff is critical for maintaining the credibility and performance of the Agency.” But when the EPA ignores its own lawyers and scientists and suppresses their findings when it reports to Congress, some might argue that this will have a chilling impact on recruitment of talented staff who want their work to be respected and appreciated. And this isn’t the first time EPA staff have interfered with work from their scientists. UCS’s Scientific Integrity program has documented at least 20 such cases at the agency. I hope that Mr. Peacock does decide to make a more direct response to all of your comments on his blog. Or, in the same way that ScottN is allowing me to “guest blog” here, perhaps Administrator Johnson will take a turn at the keyboard himself. Either way, it’s great to see this public dialogue continue online and in the press. 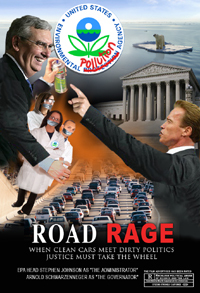 Hey everyone, ScottN back at you with something of interest, especially to the online community, regarding EPA Administrator Stephen Johnson’s dubious decision to deny the waiver individual states need to implement the California clean car standards. A little background: a few of us here have been following the EPA’s blog, Flow of the River, written by Deputy Administrator Marcus Peacock. Washington Post columnist Al Kamen recently took interest in it as well, and in his column, "Enough About Pollution Regulations; Here's a Riff on Amy Winehouse," Kamen takes Peacock to task for glossing over key issues, including the decision to deny the clean car waiver. I'm pretty senior and will be gone in a year. A good question is how do we encourage, rather than discourage, the rank and file in government to take risks and test innovative ideas? That seemed rather ironic to us, since the EPA has silenced and ignored so many of its "rank-and-file" scientists and legal staff in the past. UCS's Scientific Integrity program has repeatedly documented EPA suppression of staff scientists, and scientific information related to global warming, mercury pollution, and many other issues. So we asked activists to leave comments on the EPA’s blog, explaining to Deputy Administrator Peacock that ignoring EPA scientists and analysts on an issue as central as global warming pollution from vehicles is not a way to "encourage risks and test innovative ideas." The response, both from folks making the comments and from the EPA, has been tremendous. I’d suggest you head over to the EPA blog and have a look at the over 500 comments for yourself, as there are a lot of heartfelt and sophisticated ways that citizens are making an open appeal to the EPA to reverse its ill-founded decision. So hats off to Mr. Peacock for creating the blog, to the EPA moderators for allowing citizen input to be seen, to my fellow bloggers, like Kate at Out in Left Field, the folks at Warming Law, and Mike at WNY, for helping to spread the word, and most of all, to everyone who has taken advantage of the opportunity to flex their online muscles in defense of the environment, cleaner cars, and scientific integrity. Keep those comments coming, and have a great weekend! Hey everyone, Jim here again. I thought share some info on a recent forum we were asked to participate in. On January 31st, the Center for American Progress held a panel discussion in Washington D.C. entitled “Plug-in Hybrids: the Future of Cars?” Four panelists, covering a range of perspectives, spoke: General Motors, Honda, an expert battery consultant, and yours truly. On a number of topics, all the panelists agreed. Everyone concurred that batteries continue to be a major challenge for plug-ins, especially in terms of cost. Everyone also agreed that no silver bullet exists to get our country out of its transportation energy quandary, and that a full portfolio of technologies and policies to improve fuel economy, reduce carbon from fuels, and reduce the total amount of driving (vehicle miles traveled, a.k.a. VMT) will be required. In other words, successful plugins could help get us there, but they’re only one piece of the puzzle. GM had an optimistic view of plugins, as demonstrated by their commitment to the Chevy Volt and Saturn Vue Green Line plugins. In contrast, Honda made the case that the small additional fuel savings offered by a typical plugin over a comparable non-plugin hybrid isn’t worth the high price to consumers or Uncle Sam (who, in all likelihood, would have to incentivize at least the early vehicles to make them marketable). Moreover, Honda questioned whether the enthusiasm for plugins would last, citing the ebb and flow of interest in other advanced vehicle technologies. Battery expert Jack Deppe, from Deppe Consulting, characterized the batteries as making progress on durability, but that challenges remain, especially in terms of cost and safety. With respect to the cost challenges, he thought we may see short range plugins (in the neighborhood of 10 miles) sooner than longer range (i.e., 40-mile) plugins, though even low-range plugins still face battery cost-related hurdles. That said, he commended GM on their aggressive pursuit of the 40-mile Volt. As for me, I discussed how plugins fit into the larger transportation/environment picture, and addressed the challenges this technology faces. For those keeping score, those challenges are battery cost, safety, and durability, as well as the unknowns about the people who drive them (where they live, if they park on the street, when they’ll recharge, etc.). I also addressed how over-hyping plugins stand to hurt this promising, but fledgling industry. From an environmental perspective, the all-important questions is, of course, “how many, how soon?” and, to that, I raised the question of at what point “commercialization” becomes real. Put more plainly, at what sales volume does greenwashing end and environmental progress begin? To this last point, as reported by the Detroit News among others, GM announced at this forum that the Volt would be sold in the “tens of thousands” within a short period of its 2010 release. GM will have a challenge on their hands delivering that many vehicles, that soon, but if they start there and deliver millions more over the years that follow, I won’t argue. After all, the auto industry has historically been most innovative and effective in finding solutions when challenged. I look forward to watching GM on this front. Hey everyone, Jim Kliesch here. I know that ScottN is our resident pop culture nerd, but during the Super Bowl on Sunday, I caught General Motors showcasing their advanced and efficient technologies: plug-ins, fuel-cell vehicles, electric vehicles, hybrids, biofuels, and efficient conventional vehicles with ads like this one. Yet if you watched closely, the fine print at the bottom of the screen detailed the fact that many of the vehicles being promoted had either limited or no sales volumes. When it comes to improving the environment, sales volume means an awful lot. Engineering vehicles with the environment in mind is one thing; engineering them with an ad in mind is quite another. Now let's compare that to the host of recent announcements from Ford. First, they are planning to put approximately 500,000 of their "EcoBoost" engines, which can increase fuel economy to around 20 percent, on the road by 2013. They have also been talking about cutting weight out of their vehicles to save fuel and are going to spread electric power steering throughout their fleet in the next few years to boost fuel economy and even save money on warranty costs. And, yes, it is just a concept and it does not go all the way, but I can't help but see some hope and a little UCS influence on Ford's Explorer America "Greener SUV" concept. I'm by no means saying Ford has completely changed their stripes (note what Scott said about the '09 Escape Hybrid in the last HybridCenter.org Driving Change Network newsletter), but their emphasis seems to be more on products than PR--and that's a real step toward the end zone, rather than just an engineering lateral.